Birds carry no passports. They do not stop at Customs. They are international–belonging to the world. These migratory birds are as much a part of South America as they are a part of Panama, Mexico, the United States and Canada. International groups of researchers and managers understand that by working together in partnerships, we can achieve more than if we were all separate. The migrating birds unite the people of the countries through which they pass. an interesting group of birds because they breed and overwinter in vastly different places, traveling long distances during the spring and fall. They may overwinter in Mexico or Central America and breed in Canada or Alaska. In between these two phases of their lives, they must fly and rest and refuel; fly and rest and refuel. One may ask why don’t they just stay in Panama or Mexico, two of their overwintering stops, the entire year? This is a good question that can best be explained by a crowding phenomenon. Food and space are of course always at a premium, whether one is a human, a monkey or a bird. During the breeding season, places that during the winter can feed an adult male and female, must now provide food for young also. Often, there is not enough food to go around during the breeding season at these overwintering sites. Over a period of thousands of years, some birds flew north by chance at the breeding time, and it just so happened that there, they found more food and less competitors than at their overwintering grounds. As a result, they were able to produce more offspring than those who stayed behind, and the northward- tendency was born. We do not know exactly how this occurred, or where the first northward sites to breed were, but we do know that these groups of birds did develop a pattern of movement from overwintering sites to breeding grounds and back that we now call migration. 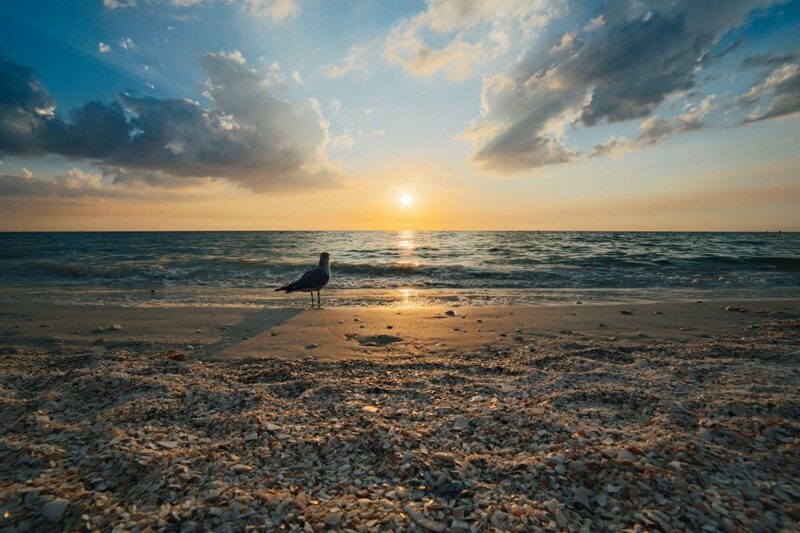 Thus today, the majority of shorebird species migrate from their breeding grounds to their overwintering grounds in the fall and return to them in the spring. Breeding grounds have an abundance of food for the birds. With the large amount of daylight in the north during the summer, plant populations grow, and with them, the insect populations who eat the plants. Shorebirds feast on these either in the adult form or when they are larvae in the many pothole ponds throughout the tundra. It is this food that sustains them and their offspring through the short summer, giving them fat stores for the long migration south in the early fall/late summer. Most people are familiar with shorebirds, for this group will feed in coastal mudflats, coastal estuaries or rocky shores along the North, Central or South American coast, or at inland ponds, lakes and reservoirs at some point during the annual cycle: breeding, overwintering or migrating. Thus, shorebirds are an ideal group to study, for they are widespread, often abundant, and very predictable in their schedule. Scientists have been conducting surveys on shorebirds for over 30 years, in places as far apart as the Yukon-Kuskokwim Delta and the North Slope in Alaska, the Fraser River Delta and Vancouver Island in British Columbia, San Francisco Bay in California, Bahia Santa Maria in Mexico and Panama Bay, just outside Panama City. These are all major breeding, overwintering or stopover sites along the west coast of North and Central America. Shorebirds that nest in Alaska use a large part of the western hemisphere for stopover sites. The stops are transient, and shorebirds touch down on North American soil for only a brief time during their annual cycle, yet all sites are important. They are links in a migratory chain. Shorebirds can only fly so far before they need to refuel. However, the long-distance migrations to and from their breeding grounds, a tendency to aggregate, and a dependence on wetlands, have placed many shorebirds at risk. These long distance migrants have wintering, migrating and breeding ranges that extend over vast areas. During their annual spring and fall migrations, they are dependent on a variety of critical habitats like wetlands, estuaries, beaches, or rocky shorelines that are typically limited in size and distribution. Concentration in some of these areas makes shorebirds vulnerable to environmental disturbance, e.g. 10% of their population stops at Baha’i Santa Maria in Sinaloa Mexico. Because of the tremendous energy demands of these long distance migratory flights, stopover habitats and resources for rest and refueling are critical to the survival and successful reproduction of shorebirds. 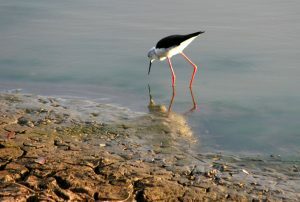 Different species of shorebirds have different habitat needs. These stopover points are “migratory bottlenecks” that the birds must fly through twice each year. The comparatively limited availability of these areas, and the prey resources that they must share, present energetic demands on shorebirds that influence their migration, reproduction, and even survival. If contamination, habitat degradation, disturbance etc. is at these stopover sites, then the birds may fail to breed, don’t migrate, or become adversely affected by lack of proper nutrients. Recent census data from North America have revealed widespread declining trends, giving ample reasons for concern about population health for many species in this group, including birds like sandpipers, knots and plovers. For example, semipalmated sandpipers in the east and mid-western parts of Canada and the United States have shown annual declines of negative 2 to 4 percent per year. Western sandpipers on the west coast have shown similar declines. Western sandpipers are on the American Bird Conservancys Green List at a Moderately Abundant Species with Declines or High Threats¡± and this include birds that are still found in relatively high numbers, but are declining at an alarming rate. Population surveys of many shorebird species show that they co-occur with western sandpipers at some of the same wetlands; thus, any information that we can find from this very common species will apply to a myriad of other Neotropical migrant shorebird species. Western sandpipers are one of the most common and numerous shorebird species. They are found at most wetlands in the western hemisphere. Even these populations have been declining. Because they are so common, they are a good model for all shorebirds. Western sandpipers (Calidris mauri) overwinter in Central and South America and breed in Alaska. They traverse the continental United States in spring (northward) and late summer and fall (southward). On their northward migration along the west coast, they stage in large numbers on large open mudflats, at estuaries or alkali flats, where they probe or glean for invertebrates. The intermountain population, on its northward journey, uses alkali flats or river banks, ponds or reservoirs where the water level fluctuates, thus exposing prey-rich mud. Much of the populations of western sandpipers and many other shorebirds overwinter or pass through Panama Bay. Panama is a land bridge between two continents, providing one of the major movement corridors within the western hemisphere for intercontinental migrants. 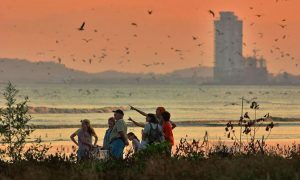 Millions of shorebirds migrate through Panama to and from their overwintering and breeding grounds between North and South America; others overwinter there. Between the breeding grounds in Alaska and the overwintering grounds in Panama Bay, there are 16 major wetlands that have been set aside as part of the Western Hemisphere Reserve Shorebird Network. These wetlands are protected by law, and are recognized internationally as important. Because of the decline of many populations of shorebirds throughout North America, the Shorebird Group of the Americas, a consortium of university, government and nonprofit organizations, has come together to address this problem systematically. They selected the Western Sandpiper, Calidris mauri, as the first species to begin the study on migration patterns and changes in population numbers. This species was chosen in part because they are present along most wetlands in all north American flyways, they are generalists, eating many different kinds of food, and because of this, are not as limited as specialists in the kinds of habitat they may choose. Also, their population is fairly large compared to that of other shorebird species, so they are easy to find during surveys. There also have been many studies on their migration, and the biology is well-known, so historical stopover, overwintering and breeding sites, as well as historical numbers from these sites, are well-know also. Understanding western sandpiper use of wetlands and its migratory ecology will help to advance understanding of various other species of shorebirds with similar ecology, and will help to address a broad range of problems in the conservation of migratory birds in general, as well as their North American Pacific coastal and inland habitats. Because western sandpipers occurs from Alaska to Central and South America, multi-national research teams have come together to study it throughout its range. Cooperative international partnerships are the key to preserving migration corridors. The environment functions as a whole, and parts of it cannot be isolated. The many partners in this project displayed in our two power point presentations coordinate management of the habitat and protection for these migrants on a broad scale to ensure widespread conservation and maintenance of these stopover sites.